Tracing its history to 1790 and the earliest application of steam pumping engines, Flowserve has grown into a driving force in the global pump marketplace. No other pump company has the depth or breadth of expertise in successful application of pre-engineered, engineered, and special purpose pumps and systems. Flowserve offers the world’s most extensive lines of ISO 13709/API 610 and ISO 2858-5199/ANSI B73.1 compliant designs along with pumps designed to ASME, nuclear, JIS and other globally recognized design standards. In addition to offering more than 100 distinct pump models, Flowserve also provides its customers unequaled engineering and technical support with the industry’s most progressive hydraulics, mechanical, materials, monitoring and diagnostics capabilities. 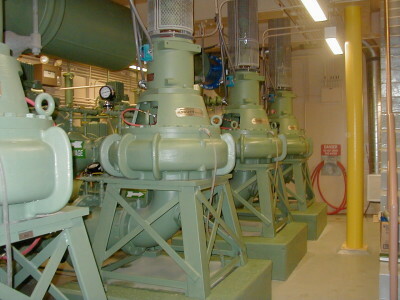 Fluid Technology is your source for Flowserve pumps in Municipal Markets. Water is ubiquitous, covering 71 percent of the earth’s surface. It is essential to human, animal and plant life. It is critical to industry from agriculture to steelmaking. It can be incredibly powerful and even more incredibly destructive. Harnessing its virtues and controlling its power require pumping systems that can handle almost unimaginable volumes and pressures with complete reliability. Water resources applications are extraordinarily broad – source water and transmission, treatment and distribution, waste water, irrigation, flood control, drainage, dry docks, reclamation and restoration, etc. Desalination is becoming more prevalent in order to meet the potable water needs of a growing global population. Flowserve was born in water resources more than 220 years ago and is among the few companies which have the engineering expertise and the breadth of applications experience to meet these varied requirements.